February 26th in Premium Plug-ins by Wordpress Jedi . One of the best ways to get folks involved with your WordPress blog is by allowing them to opportunity to interact with you and your website. There are many ways to do that. You can allow folks to chat with you right on the side. You can allow folks to move things around on your site. 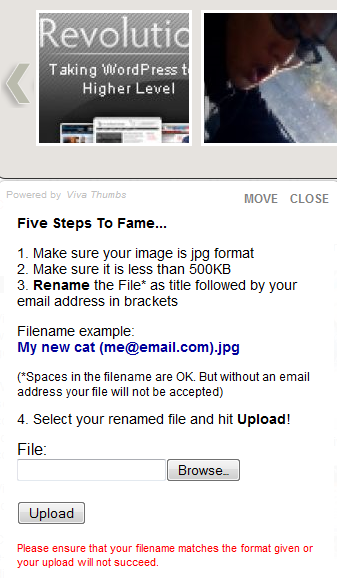 Or if you are using Viva Viral UserPics, you can let folks submit their photos, art work, and so on. Viva Viral Userpics is very easy to use. You allow your users to upload their image (as long as it is within the size limit) and upload them to your site. Now before you jump and complain about security issues, you get a chance to approve every image, so your WordPress installation is safe. Once your users add their photos and you confirm them, their images show up on your carousel (see above image). There are many ways to use Viva Viral UserPics. You can use it to display your sponsors’ offers. You can also charge folks to add their photos if your site is very popular. But even more important than that, the interactivity that this plug-in adds to your website can get you new visitors fast. Your take: How would you use Viva Viral UserPics on your website?